The main purpose of the website is to inform and connect all catholic students’ entities and promote events held by the Roman Catholic Archdiocese of Maribor, especially in the city itself. Events hosted by every student entity will be posted on this website. It also offers information on spiritual, educational and social events that may appeal to students. The website can also serve as a bulletin on useful pieces of information that will help to broaden your general knowledge. For example, you can post a title or an image of a fine book you have read, a movie you have seen or just provide the name of a good speaker you have had the opportunity to listen to. You cannot chat or comment on the page due to its function as a bulletin board. However, you are welcome to contact the keeper of a certain column and send all materials to them. So, the purpose of the page is to connect, inform and create. We thank you for your visit. THE BENT CROSS CRUCIFIX – The famous bent crucifix symbol, always used by our patron Pope John Paul II. He had the same type of a crucifix when he visited Slovenia. The cross is yellow: this is the colour of Vatican City State, but it also represents the Light, the Light of God. The shape of the crucifix represents an embrace and God’s protection. THE LETTER M – Represents the city of Maribor. The colour red symbolizes love, youth, easiness and vitality. THE OPEN BOOK – Represents learning and the Holy Bible. The colour blue symbolizes wisdom. 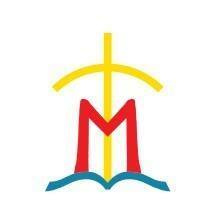 The crucifix rises from the book right through the middle of the letter M and gives it unity. THE INSCRIPTION – It matches the University of Maribor’s logo and symbolizes the University. Student Mass is held every Wednesday at 7.30. P.M. This year we will change locations of the Masses in order to get to know each other better. Every 2nd Wednesday of the month in Franciscan Church Maribor at 7.00 P.M, (Bishop Maksimilijan Držečnik Street) followed by a movie night in the Franciscan dormitory. Every 3rd Wednesday of the month at the School Sisters’ chapel. (17, Strossmayer Street, opposite the III. gimanzija Maribor – High school) Occasionally, a prayer will be organized and an Eucharistic adoration. At the same time, you will be able to go to confession or have a personal conversation with a priest. In case of a 5th Wednesday of the month, the mass will also take place in St. Mary Magdalene Church. Any changes will be posted on the present website. There will be no Mass during public holidays.